I’m writing this devotion on January 30, 2013. 65 years ago, today, Mohandas K. Gandhi was assassinated. I was 12 years old when the movie Gandhi came out, and I saw it three times in the theater. That’s an accomplishment, considering its 3hr 11min running time! It’s amazing what this one man accomplished. Trained as a lawyer, he did his work not in the courtroom, but in the hearts and minds of people he touched. He led both Hindus and Muslims to civil rights in South Africa, before achieving independence from England for India. These are difficult actions, but this simple little man accomplished it all without violence. He rallied millions to revolution, without use of the sword. Recognize this quote? 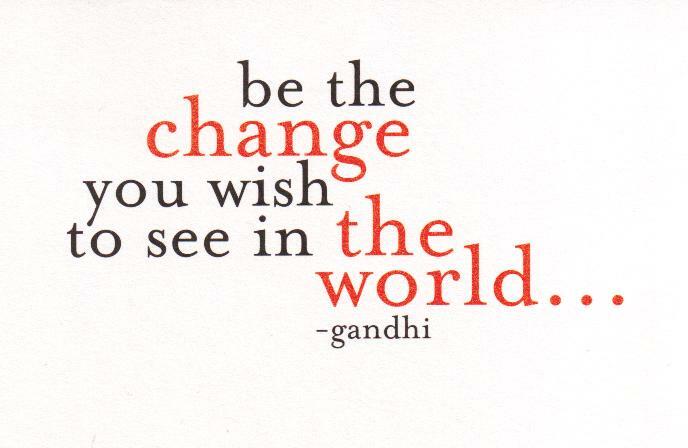 “Be the change you wish to see in the World” Yep, Gandhi said that. And he did that. Remember this one? “An eye for an eye leaves the whole world blind.” He was one of those rare people who could clearly see the way things ought to be, and choose to live that way without compromise. Please visit this page to read many excellent quotes by this amazing man. When I watched the movie Gandhi at the age of 12, I believed that anything was possible. Even when I saw Ben Kingsley portray Gandhi’s death on the screen, I believed, amidst my tears, that there was hope for this world if people like Gandhi pointed the way. I swore I would practice non-violence in my life as a Christian. So how have I done? 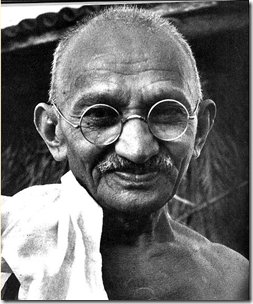 This is my second attempt at a devotion about Gandhi. I wrote the first one and my computer promptly lost it. My first reaction was violent. I wanted to scream and throw or smash something! Oops! Apparently I have a long way to go before I can live up to Gandhi’s vision for the world, let alone Jesus’ vision. But I’m reminded, today, to keep trying. 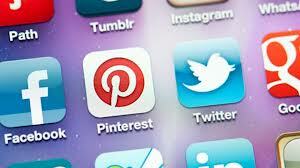 Liking, following, reblogging, pinning, and sharing. There are 1.01 BILLION people on Facebook. Tumblr (a blogging site) cranks out 55 million new posts every day. But only about 20% of U.S. citizens go to church on Sunday. How do we get the word out to people who won’t come and listen to a sermon? By liking, following, reblogging, pinning, and sharing. You know those inspirational or thought provoking posts you come across every day online? Think of them as tiny little mini-sermons. Not enough space to present the whole gospel, just enough to make an impression in the 2 seconds it takes to scroll down the page. What if those little mini-messages amount to more than warm fuzzies? What if this is how the Gospel gets spread to people nowadays? I posted them to Facebook, Pinterest, Tumblr, Twitter, and WordPress. (Those are all different social networking sites, in case you aren’t familiar), and tagged them all with the name of my blog site: AdventureChristianity.com. I can only estimate, but in that amount of time, I figure thousands of people have seen some of these short messages. Maybe more. Have you ever stopped to think about what happens when you “share” something, on Facebook, for instance? When you share an article, a cartoon, or a quote like the one above, everybody on your friends list sees it in their feed. So when you share something inspirational, you’re actually practicing e-vangelism. And then your friends have the possibility to like or share it for their friends. That’s how some posts spread like wildfire across the web. I posted this to all the sites to see what would happen. Within half an hour 3 people on Tumblr had reblogged the post for themselves. One was a teenager girl, a Christian. One was a teenage boy, recovering from cutting himself. The third was a 30 year old gay man struggling to be accepted. Wow. In half an hour, not only were these 3 people comforted by Jan’s hopeful quote, but now that post exists on four people’s blogs. And everyone who visits their pages gets to see it. And so on, and so on. Isn’t that cool? Maybe you’re not an online person, if so this may sound like I’m speaking a foreign language. Sorry! But if you are one of the vast majority who connect with others online, take this to heart: You don’t have to create your own artwork or post your own quotes, although it’s fun and easy to do. Just pass on to others the things that resonante with your faith. And there’s no need to overshare, just a couple things a day will deliver the message. If you surf the internet as an e-vangelist, you might find yourself passing on Good News to people you know, and people you don’t. Again, the messages are shorter than any sermon you’ve ever listened to, but they can still be a glimpse of the Kingdom for someone who needs to see it. It’s our first communication with people from another planet! We learn that they have superior agriculture, and unlimited free energy. Sound like a cheesy sci-fi movie premise from the 50’s, doesn’t it? Well it is. The movie is “Red Planet Mars,” from 1952, starring Peter Graves. You can watch it on Netflix here, if you’re a subscriber, but be forewarned, it’s no Star Wars! It’s a cold war propaganda piece that takes a sudden right turn into matters of faith. And I kind of loved it. 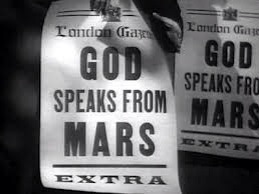 Here are these unseen Martians quoting us passages from the Bible (King James version, I might add!) The whole world is astounded and comes back to the church in droves. The iron curtain is torn down. Every last no good bum finds their way to God, and the world is saved! Do you think it would really work like that? If we picked up distant radio signals from another world, telling us to love our neighbor and abandon our sinful ways, do you think the world would change overnight? Why would the Good News, coming from so far away, be able to accomplish what the Good News struggled to accomplish when it walked right here among us? Jesus delivered the message of all messages, about God’s love for us, and our need to love our neighbors and practice servanthood as clearly as has ever been stated. 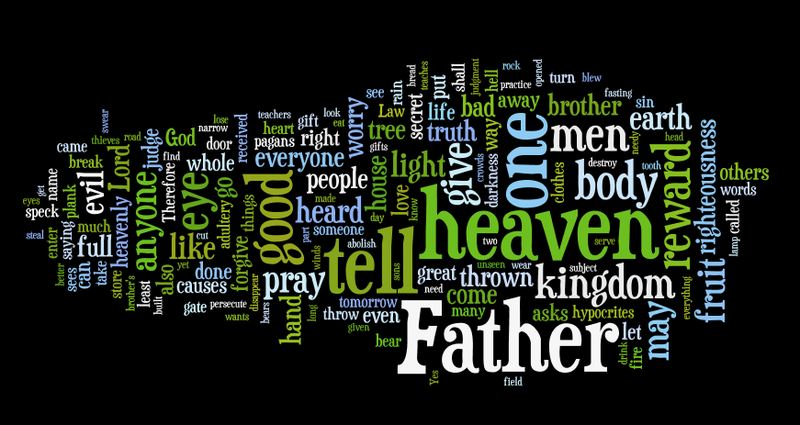 The actual Sermon on the Mount is an unparalleled collection of words to live by. The words are available in every church and book store and hotel room from here to the North Pole, but let’s face it, even die-hard Christians have trouble heeding them. I suppose a voice from the heavens would carry some outside authority, some confirmation that God really means business. Maybe we’d all take this Jesus business more seriously. For a while. Here’s why I’m leaving the church. Oh no! I’m not quitting. Not renouncing. Not giving up. Don’t worry! I’ll be back in an hour or so. I’m just grabbing a bite to eat. I mean, you can’t expect me to stay in here forever, can you? It’s a nice church and all, and I’ve even cleaned my office, but these days I get a little claustrophobic. Back in the 90’s, when I first was able to get online (can you say dial-up?) I was the biggest fan of America Online. AOL. I lived for that little voice that said, “You’ve got mail!” I loved their preselected news stories, their handful of games. It was the whole world to me. Except, it wasn’t. There was a whole other world looming out there. The web. Slowly, friends of mine stopped subscribing to AOL. They started just logging right in to the Internet, via one internet service provider or another. They were just…out there on the world wide web, with no structure, no platform. Just…surfing. Eventually, I came around. Where I once felt liberated to be on AOL, I started to feel constrained. Like I was hiding out from the rest of the web. So I took the plunge, and it’s been great. Nowadays I still have my “safe” places, (my sanctuaries) on the internet. I check my Facebook page many times a day, for instance. But I’ve become a surfer myself, not afraid to explore without a safety net. That’s why I’m leaving the church. The building, anyway. For lunch. I’m ready to interact with all kinds of people in all kinds of places. I don’t need an artificial framework to act as training wheels anymore. I still need church, but now it’s like my home page. My launch pad. My networking hub. It’s where I get spiritually focussed for the real world around me. So that’s it. I’m out of here. In an hour. Or two. P.S. Check out my new page, AdventureChristianity.com. New Art and Memes for Adventurous Christians! Subscribe to get them fresh, or “like” the Facebook Page!